Tanjung Gemok Jetty, located at approximately 30-40 minutes drive from Mersing, is also mainly served by the ferry operator Bluewater Express and some private speed boat operators who are available for charter transfer. Tg Gemok Jetty is located between Endau and Rompin, within the state of Pahang. 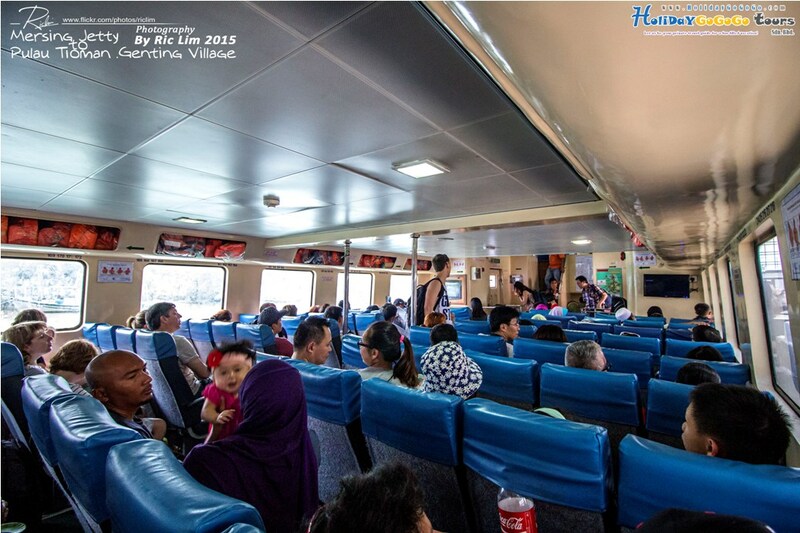 The public ferry to Tioman Island from Tg Gemok Jetty is sailing on a more stable schedule in which the ferry sailing from Tg Gemok to Tioman normally scheduled in late morning, and return from Tioman in early afternoon. The reason behind is that the jetty is not affected by the tidal condition. Click here to check the Tg Gemok Jetty to Tioman Island Ferry Schedule. The travel time from Tg Gemok Jetty to Tioman Island is approximately 1.5 hour – 2 hours depending on which village that you will be alighting. 1. Whatsapps to +6016-3796385 and make ticket reservation, this booking method is the simplest way to make reservation. You will need to collect the ferry tickets at least 90 minutes in advanced to avoid the ferry tickets released for other walk in travelers. You will be asked to provide with your full name and contact number. 2. Book an all inclusive tour package, such package normally includes ferry tickets, accommodation, meals and snorkeling. Make it easier for your travel planning and also ensure the ferry tickets reserved as part of the package. The ferry ticket price is varied between RM75-80 per person for 2 ways depends on the season and date. Address for Tg Gemok Jetty – Terminal Ferry Tanjung Gemok, 26820 Rompin, Pahang. Estimated travel time from Kuala Lumpur to Tg Gemok Jetty is 3.5 hours. 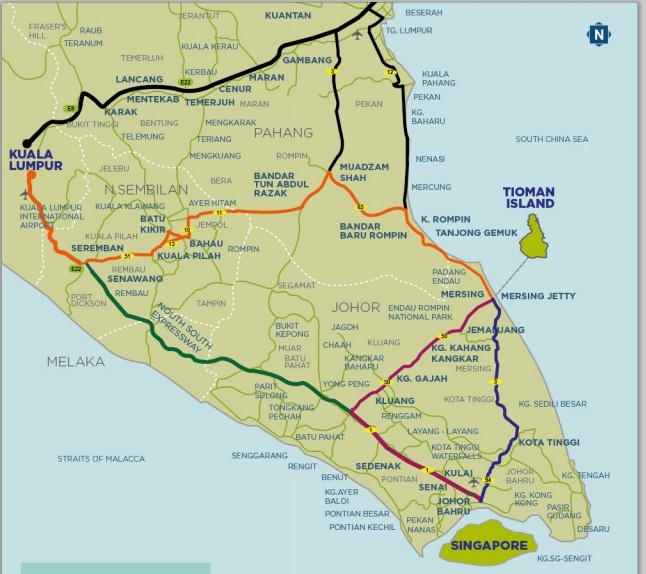 Singapore – Johor Bahru – Kota Tinggi – Mersing – Tanjung Gemok. Estimated travel time from Singapore (ICQ) to Tg Gemok Jetty is 4 hours. Johor Bahru – Kota Tinggi – Mersing – Tanjung Gemok. Estimated travel time from Johor Bahru to Mersing Jetty is 3 hours. Refer to “coach to Mersing Jetty” section, the coach from Kuala Lumpur to Mersing will passby Tg Gemok Jetty, please request to driver in advanced for alighting at this jetty. Visitors from Johor Bahru may need to take a trip to Mersing Terminal by coach and follow by a taxi ride to Tg Gemok Jetty. The journey from Mersing bus terminal to Tg Gemok Jetty takes approximately 30-40 minutes and cost about RM50 per taxi per trip. Visitors may also consider charter a taxi from JB Larkin Terminal to Tg Gemok Jetty directly, the approximate taxi fare is RM250 per trip. This may be a good option if you will need to catch the ferry departs from Tg Gemok Jetty at 11am as the earliest bus from Larkin departs at 8am, you may not have sufficient time to transit via Mersing Terminal. Refer to “coach to Mersing Jetty” section in Travel to Tioman Island via Mersing Jetty, the coach from Kuantan to Mersing will passby Tg Gemok Jetty, please request to driver in advanced for alighting at this jetty. There is no bus station in Tg Gemok or near to Tg Gemok Jetty, however, the bus from Kuala Lumpur or Kuantan heading to Mersing would passby the jetty, hence, the travelers may alight at Tg Gemok Jetty with advanced notice to the coach driver. Johor National Park fee is not imposed for visitors travel from Tg Gemok Jetty to Tioman Island. The ferry services in Tg Gemok Jetty operate during peak season only (February to November) and stop during Monsoon Season. Visitors to Tioman during the monsoon season may need to travel via Mersing Jetty or by flight (Tunamaya Air).